Kansas City and its environs keeps appearing on recent lists of most livable towns and best cities for relocating families (pdf), so all this development hasn’t slowed much even with the current real estate dip. One of the latest buildings to pop up near here is the preternaturally landscaped BassPro Shops complex. The Pacific Northwest has its REI stores with their climbing walls and water bottle pumping stations and fake rock paths winding along next to the shoe department. 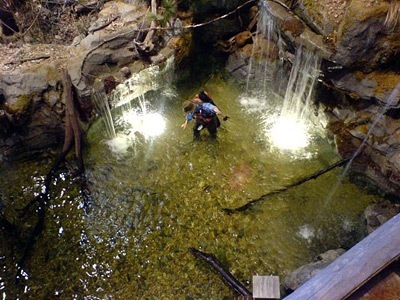 Here, within a morning’s drive from the Ozarks, we have BassPro Shops. This is the place to visit if you’ve never held a rifle or a fishing rod, never tried on a pair of waders, never perched in a treestand with a crossbow or kicked back in a camouflage rocker recliner (choose from three favorite camo patterns: Realtree Hardwoods HD, Advantage MAX-4 HD or, my personal preference, Mossy Oak Breakup). Visit the BassPro website — where you can find the GPS coordinates of each store in the US — to create your gear wish list. You can also learn how to tie fishing knots, get step-by-step instructions for cleaning wild turkey, begin training your hound, compare tips on making backwoods coffee, and collect some easy outdoor cooking recipes. You can also sign up for training courses on carrying concealed handguns or attend the all girls’ weekend in the wild, complete with dutch oven cookery, canoe paddling, and a fashion show. Construction continues on a BassPro Shop in Manteca, California, just south of Stockton. The 120,000 square foot complex will open in October 2008 with great fanfare. Until then, though, I’ll have to stock up on supplies here in Missouri. After gazing over the lake behind the store, where serious shoppers can try out the snazzy 2008 model motor boats, I was lucky enough to catch a clearance sale on fishing lures. My mom, who prefers free worms from her garden or microwaved chunks of hot dogs, and my dad, who nets his own live minnows, were amused by my armful of colorful souvenirs. I packed them away in my suitcase — art, décor, jewelry, crafty DIY supplies! Meanwhile, my aunt braved another Midwestern thunderstorm to drop off a large pot of homey, still-warm fish soup, made with the 20-pound head of a very local, very fresh catfish. My family can rest assured that although I may not know the first thing about casting nets or noodling, I do know how to cook and eat the critters once they’re in my kitchen. Served simply or garnished elaborately, chao is the both weekday breakfast and weekend brunch food of many an Asian family. The fish counter at Asian markets always have large fish heads on ice. As always when selecting fish, look for one with bright, clear eyes and very red gills. Ask them to split the head for you or, if preferred, cut it into large chunks. Rub the fish head well with the fish sauce and garlic. Let marinate 30 minutes. Meanwhile, heat 2 tablespoons of oil in a large heavy pot. Add the onions and sauté until softened. Add the rice and sauté for 3 minutes, taking care not to let the onion brown (or the soup will become muddy in color). Add the chicken broth and 8 cups water. Bring to a boil, then reduce the heat and simmer for 2 hours, or until creamy smooth. Stir occasionally and add water, if needed, to maintain a creamy consistency. In a large skillet, heat the remaining oil. Add the fish head and cook about 5 minutes on each side. When the garlic is fragrant but not yet browned, transfer the fish head with the garlicky oil to the simmering rice soup. Arrange the garnishes in small bowls at the table. Adjust the flavor of the soup, adding fish sauce to taste, and flake off bits of meat from the fish head into the broth. Serve hot in large bowls. Your artificial lure photo is freaking me out! 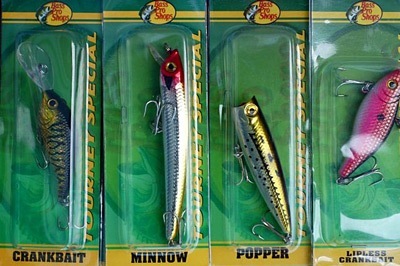 Cranky, Minnow, Popper and Lipless sound like Pixar characters. 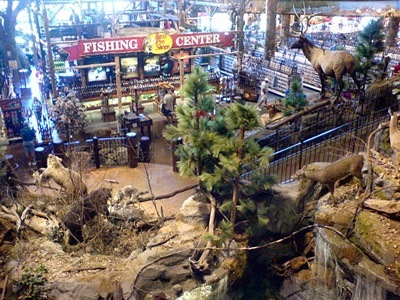 This photo triggers a memory of when I was growing up in the Ozarks, within line-casting distance from Bass Pro. The first time I smoked pot was in the back of my friend’s parent’s artificial bait manufacturing shop. I remember seeing thousands of tiny luminous eyeballs all rattling in unison as I nudged a worktable. The walls were decked with a rainbow of rubber worms, where each had a hook slightly protruding from its abdomen. (What IS that odd, seemingly cancerous smell that these these tiny siren songs of the fish world possess?) Not long after this experience, naturally, food soon came to mind, With the 80s being before Fast Food Nation consciousness, we each found ourselves soon ingesting a couple Big Macs each, only to find ourselves soon afterwards in a deep food coma as we lay on the cool concrete floor of that artificial shop while listening to Pink Floyd. Popper, Minnow, Cranky…you are my mother, teacher, and secret lover. Hey, Thy, I’m totally going to check out the Manteca store. I just got back from Homer, AK — the Halibut Capital of the World– full of “barn door” halibut & a halibut lottery where anglers can win big. Makes you want to know how to reel ’em in! But I wonder, do fisherman wear camo for the fish or for the fashion statement?